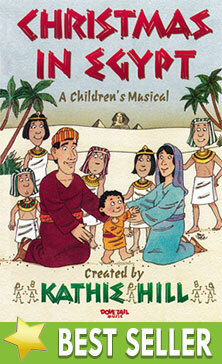 Christmas In Egypt : Kathie Hill Music, LLC, Making music with and for kids for over 25 years! Using the flight to Egypt as the historical background, Kathie Hill creates a story of the possible relationship Mary, Joseph and the Christ-child might have had with their Egyptian neighbors. As Joseph relates the story of Jesus’ birth, even the most unbelieving adult learns to see Christmas through the eyes of a child. Production helps include Performance Notes and Stage Diagram in the back of the Choral Books. Kathie’s Note: A different, but creative approach to the Christmas story. The “what if” premise serves to give children a glimpse into Jesus’ life beyond the manger and the use of a toddler on stage –really sets this work apart. The kids love wearing the Egyptian garb and the Pharoah, Herald and Belles of the Nile are hysterical. This is one of my favorite musicals…so funny, yet so tender. Downloadable pdf of all songs, script, production notes & piano transcription for Christmas in Egypt with permission to make 3 copies for each $11.95 license. Additional copies require purchase of additional 3x license/s. Includes all Posters & Teaching Cards. Original Dovetailor "guts" with up to 100 pgs of detailed plans for kick-off, enrollment, rehearsals, auditions, musical and spiritual activities for every song, all color coordinated Teaching Cards & all color posters referenced in lesson plans.